​​Design stable analog and digital power supplies in minutes! Stabilising a power supply using WDS could not be simpler. The user simply selects their topology and types in their input/output specification into WDS. The software will then automatically select the appropriate component values for this design. At any stage the user can change the component values away from those automatically calculated by WDS and enter the actual component value used in their design. From power stage component selection to poles, zeros and controller coefficients; our advanced PSU design software, WDS, will greatly simplify the task of designing a power supply whilst still keeping you in control at every stage of the process. WDS has been designed as the ultimate toolbox for the power supply design engineer. We regularly run hands-on workshops. All attendees to our analog and digital DC/DC workshops will receive a a l limited complimentary license for WDS if they wish to try it. 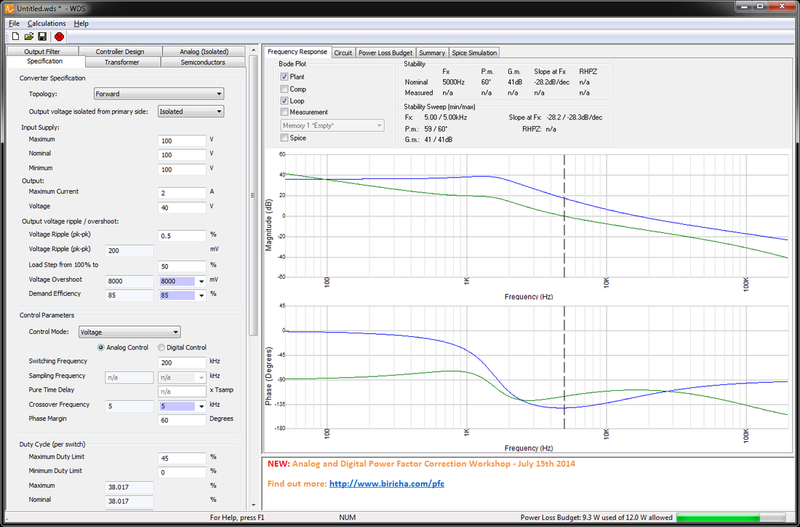 Easily verify the stability of your power supply using the Bode plots in WDS. 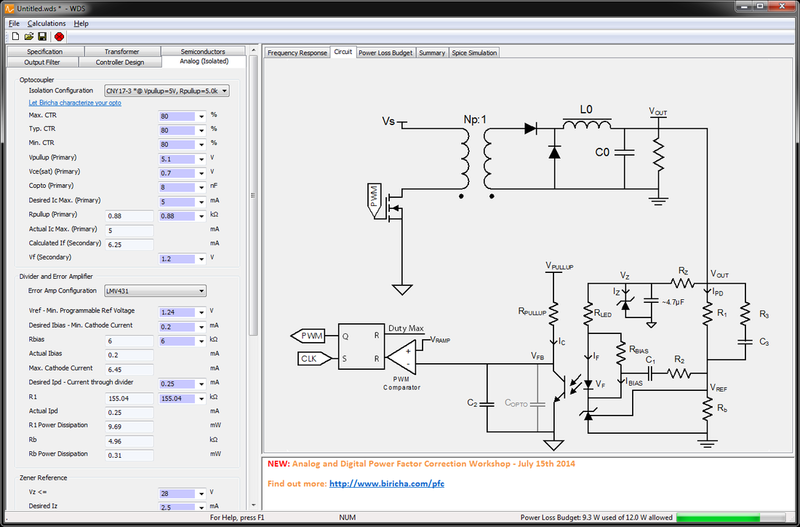 WDS supports opto-isolated compensators and calculates all of the nessesary components. ​WDS will automatically place the controller poles and zeros such that the power supply will meet the stability criteria (crossover frequency and phase margin) specified by the user in both analog and digital domains. In addition, all component stresses, transformer specification and losses will be dislayed so that the user can quickly select the correct parts. This is an extremely powerful power supply design tool with the aim of saving you months of R&D time. All this and more! Download the free trial today! The trial mode is fully featured however, the input/output voltages are locked. All other features can be used. All attendees to our analog and digital DC/DC workshops will receive a complimentary license for WDS. WDS currently supports the following topologies with both analog and digital control loops. as well as a generic calculator suitable for most other devices. 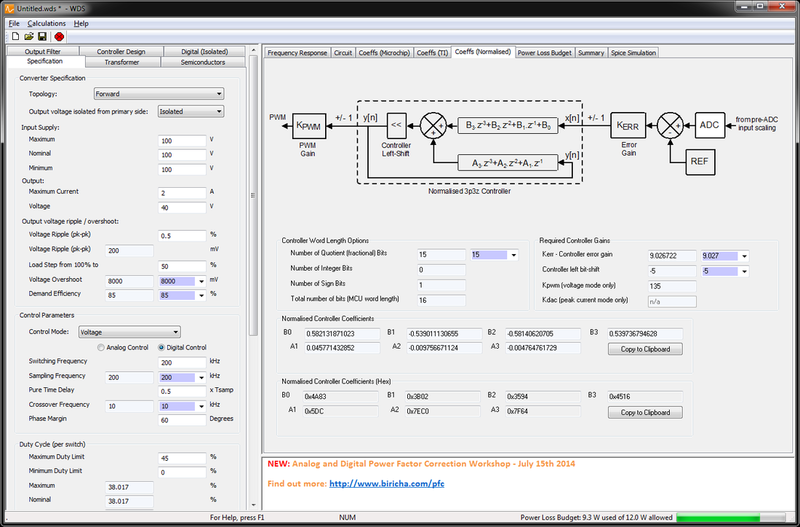 The Bode 100 support for WDS allows the user to import and export data to the Bode Analyzer Suite (BAS) software from Omicron Lab. BAS is used to interface with the Bode 100 vector network analzyer and allows the user to measure the frequency response of the loop, plant and compensator in order to verify the crossover frequency and phase margin. WDS will allow you to overlay the actual measured frequency response from the Bode 100 VNA on top of the simulated traces within WDS. Overlay Real MeasurementsUsing WDS with Bode 100 support you can easily overlay real world measurements acquired using the Bode 100.